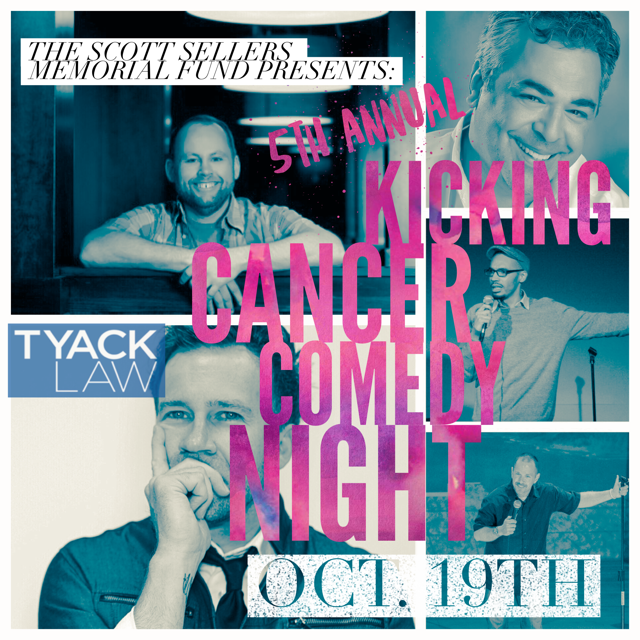 The Tyack Law Firm is a proud partner of the 5th Annual Kicking Cancer Comedy Night with The Scott Sellers Memorial Fund. The “Kicking Cancer Comedy Night” is a memorial charity event started in 2013 in memory of Scott Sellers. Scott was diagnosed with a brain tumor in February of 2004 and passed away in March of 2005. This outing is a way to celebrate Scott’s life by doing one of the things that he loved to do. . . LAUGH! All proceeds from the Kicking Cancer Comedy Night will benefit brain tumor research at The James Cancer Hospital and Solove Research Institute. To date, the Scott Sellers Memorial Fund has donated nearly $90,000 in the fight to kick cancer. Register for the 5th Annual Kicking Cancel Comedy Night here. If you are unable to attend this year’s event, please consider donating to the Scott Sellers Memorial Fund through the event information page. We are fortunate to have Dan Swartwout join us again this year. Dan has been a part of all five Kicking Cancer Events. Dan’s high energy comedy performances have been instrumental in the growth of this charity event. Dan always assembles an outstanding team of comedians. This year we are honored to have Dino Tripodis, David McCreary, Jason Banks and Jeff Robinson with us. Thank you, Dan, Dino, David, Jason and Jeff for contributing your time and talent toward the fight against cancer. Dan Swartwout – Dan Swartwout is a nationally touring stand-up comedian who performs at comedy clubs across the country. Dan was selected for the Boston Comedy Festival, won the Carnival Cruise Comedy Challenge, and is the studio audience host for the Ohio Lottery Game Show Cash Explosion. Additionally, Dan has performed at the Atlantis Resort in the Bahamas, has been the warm-up act for CNBC’s Mad Money, and has been a guest on numerous television and radio shows across the country. In 2015, Dan made his national TV debut when he performed standup on an episode of HGTV’s House Hunters. Dan’s CD, “100% Certified HPA,” debuted in the Top 40 on the iTunes comedy charts and is currently in regular rotation on Sirius/XM Radio. Dino Tripodis – Columbus radio legend Dino Tripodis was one of the hosts of Sunny in the Morning with Dino and Stacy for 24 years. He’s also a comedian, writer, and filmmaker. His company NEVER THE LUCK PRODUCTIONS has produced shorts and feature films, and his humorous cocktail book THE 25 DAYS OF CHRISTMAS COCKTAILING is a holiday favorite. Dino recently launched his first podcast project WHISKEY BUSINESS. David McCreary – David McCreary has been performing comedy and magic since he was twenty years old. Combining rapid-fire quick wit and unbelievable sleight of hand, David will have you scratching your head one moment and holding your sides from laughter the next. David takes pride in performing magic that’s not “cheesy” – but magic you’ll be talking about for weeks and months to come. David has also been the host of the Ohio Lottery Game Show Cash Explosion since 2007. Jason Banks – Jason has a unique and refreshing style of comedy that has led to performances in some of the nation’s hottest rooms. He recently recorded his first national TV appearance for Laff Mobb’s Laff Tracks, which airs on Tru TV. His natural ability to connect with any crowd with humorous yet over exaggerated stories has placed him as one of the top comedians in the Midwest. After winning the funniest person in Columbus contest as well as being named funniest person in Ohio, Jason has shared the stage with big names such as Jim Breuer, Carlos Mencia, Bruce Bruce, and Gary Owen. Jeff Robinson – Jeff Robinson has performed comedy in clubs and at charity and corporate shows throughout the Midwest, working with such comics as Brian Regan and Bobby Collins. In 2003, he helped launch the first Comics for a Cure fund-raiser for the American Cancer Society in Delaware, Ohio. In 11 years, the annual event raised more than $125,000 for the ACS.